Home »Posts Tagged "Thomas Jefferson"
American and proud. Tomorrow is a national holiday and patriots’ day for the US. 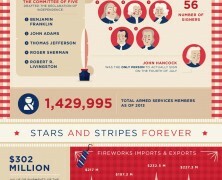 Guys from Quicken Loans picked some historical data and facts about July 4th festivities and its constitutional background.